From forehands to backhands, serves to volleys, here are beginner's tips on how to play tennis for developing a solid foundation of the game. Success in tennis depends on focus and mental conditioning. 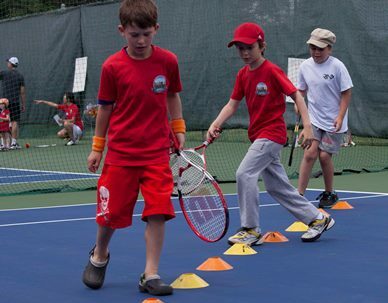 NYTA Academy coaches their students to “keep your eye on the ball” — don’t watch your racquet or your coach. This is just as important as physical training and will help you get through tough matches. Focus on Depth and Long Rallys. Keeping the ball at the back of the court is your No. 1 weapon during long rallies. The NYTA Academy also recommends to “keep the rally going as long as possible.” This will force your opponent to make an error and give you an advantage. Shot preparation is as important to making good shots as the actual execution itself. By having your racket back in preparation for the shot makes the difference between a weak shot and a winner. Unlike natural ability, mobility is something you can actually improve with practice. Increase your flexibility and your court coverage will improve by staying loose.